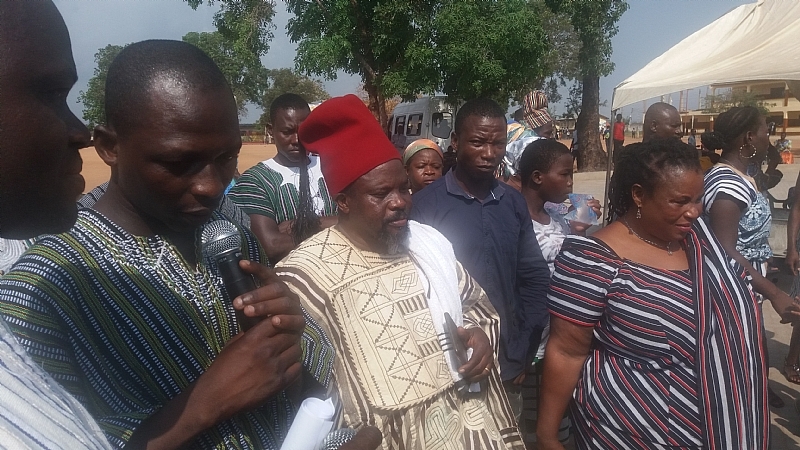 The Paramount Chief of the Nangodi traditional area of the Upper East region, Nangonaab Naperiyong Asacye Yelzoye ll has advised the youth to embrace education and cultural values of their communities to enable them understand their history and traditions. He said the culture of every people tells them of their ancestral background and where they find themselves today.Culture he noted is the only surerest way of bringing people of the same values and tradition together. He said the promotion of culture for development is non-negotiable in the country's development paradigm. Culture, he stated, was worth sustaining and aimed at rallying people together to see one another as a brother or sister especially in reconciliation and peace building. Nangonaab Naperiyong Asacye Yelzoye ll, who was the guest of honour, was speaking at the Accra Frafra Catholic Youth Cultural Festival held at the Holy Family Parish Church at Mataheko in Accra. He was particularly grateful to the organisers and thanked the leaders for such a noble cause. The festival brought together Frafra youth from six member Catholic church comprising Holy family parish ,st kizito from nima.st.theresahs church,st. Peter cleaver,st.Francis of Assisi,Tema and st Michael at Ashiaman. The chairman of the st.john Paul ll of the Frafra Catholic youth wing of the Accra diocese Mr Eric Ayoo speaking at the event explained that the purpose of such cultural festivals of this nature was aimed at promoting the culture of the people through dances,displays of traditional foods and customs. According to him the culture of the people is a determining factor of the identity of any group of people and for perpetuity of such an identity and sustainability.The occasion witness displays of traditional foods of all kinds mostly from upper East region of Ghana. Some of the food variety on display included Tuo Zaafi popularly know as TZ.Some foods prepared from millet and Shea butter were all available to eat.Some traditional regalias of the northern regions were worn by some Frafra men to signify bravery during war fronts and it's significance explained to the gathering. The Frafra people are one of the most educated people from the northern and upper regions of Ghana. They have a formidable association of Frafra people,notably Bongo,Nangodi,bolgatanga and tongo. They are also noted for having some rich foods like tuo zaafi, tubaani, koose with koko and some beverages like pito and zomkrom.The Frafras like all other ethnic groups in Ghana are basically agrarian,practicing mainly subsistant farming. The main cereal crops produced are millet,sorghum,maize,rice and beans. The organisers of the event were hopeful that next year's programme will be much bigger and better in which other Catholic branch churches are expected to join.